We are out of the book sales business! We no longer sell books. Please contact the following people or organizations that may have copies for sale. A listing here is not an endorsement, but an attempt to assist those who would like to obtain copies of the books I published. We used to offer a series of three volumes of Historical Lighting Reprints which help document the development of kerosene lighting in Victorian America. These books illustrate and price over 1800 lamps and are great references for collectors and researchers. They can save you money by enabling you to buy wisely. All have received great reviews from buyers. Each volume is described below - for more information and sample images see the links to the left. There is a handy summary that gives an overview of all three volumes (downloadable pdf) . The 1883 Bradley and Hubbard Catalog, with 248 pages showing almost 600 antique oil lamps, is a high quality reprint complete with a price guide that lists both the original prices and the current estimated values. Many kinds of kerosene lamps are shown: chandeliers, hanging, bracket, table, and figural, as well as cigar lighters, match holders, call bells and clocks. Most lamps have burners, chimneys and shades making this a great reference on how to properly outfit a lamp. This was our most popular volume. Response from the hundreds of happy buyers has been very enthusiastic: "Excellent Book...Very Pleased ...Every serious B&H lover better get one!!" "Wonderful book and fast service" "It's really a terrific piece of research and you did a fabulous job printing it. Congratulations!!" 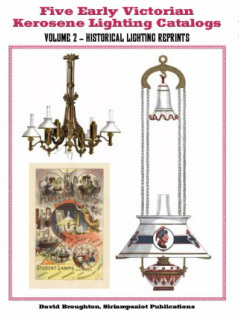 Volume 2 contains a collection of five rare kerosene lighting catalogs from the 1860's to the early 1880's. With 220 pages, 60 in full color, and illustrating about 420 lamps and parts, it is perhaps the finest kerosene lighting reprint ever! 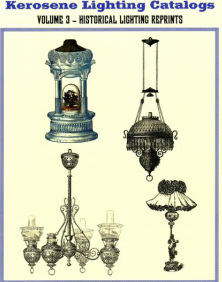 All types of early lamps are illustrated in a very high quality reprint - hanging lamps, chandeliers, bracket lamps, table lamps, some figural lamps, wonderful burners, shades, chimneys, and smoke bells. The five catalogs include two from the Tucker Manufacturing Company (patterns later acquired by Bradley and Hubbard) showing wonderful examples of fine early cast iron work. This company was one of the premier lamp manufacturers of their time, but their lamps have not been well documented until now. Also included are a J. Ives Company catalog illustrating the Ives patent burners and many lamps, a Union Glass Company catalog that includes many Lomax patented lamps as well as fonts used on Bradley and Hubbard lamps, and a Manhattan Brass Company Perfection Student Lamps catalog. 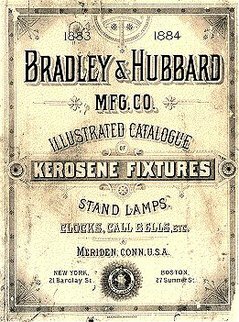 The catalogs are augmented by additional ephemera, a price guide, information on the catalogs and companies, patent information and a cross reference showing lamps that occur in multiple catalogs (including the 1883 Bradley and Hubbard catalog). This volume will delight kerosene lighting collectors and is a must-have reference for those interested in kerosene lamps of the 1885 to 1895 period. Four original, never before reprinted, catalogs from two important manufacturers and two large American retailers have been combined into a single reference. Included are an Adams & Co. catalog c. 1885, a George Bassett & Co. (New York City retailer) 1889 catalog, an Edward Miller & Co. catalog c.1894 and a Pitkin and Brooks (Chicago retailer) 1892 catalog. Plus introductory chapters on the companies and catalogs, additional ephemera, patent information, and a price guide. These catalogs illustrate about 750 lamps and parts. The Adams & Co. catalog is in color and there is a full-color cover. The volume includes hanging library lamps, round-wick banquet lamps, figural lamps, glass lamps, piano lamps, table lamps, shades and other lamp parts. There is a wealth of information that will allow you to ensure your lamps are complete and outfitted correctly in this high quality reprint. Something for everyone - rare lamps and those that are more affordable. As with all of my limited edition reprints there is both good quality and good value.